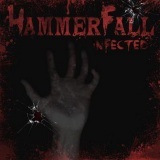 Of all the attempts to change image and direction that various metal bands have gone through, none surprised quite so much as when Hammerfall announced that their next album would be called Infected and showed off that cover art without the usual hammer-wielding cartoon prat, instead like something from a survival horror game. Eyebrows flew up everywhere, not least because the idea of Hammerfall changing direction is completely bonkers – if Joacim and co can do it, then no-one is safe! Well, rest easy, for although the trappings are different the inside is still very much the same, glorious powerful metal anthems that will have the bleakest of souls waving their arms and chanting catchy choruses. I feel bad when typing ‘the same’ as it is a little unfair to Hammerfall – this is pretty good material, in several spots making real effort to get out of their creative rut even as they slip back into it elsewhere. Take six-minute opener Patient Zero, which starts with a siren and hammy female announcements of contamination breaches, before a stomping doomy riff begins, backed with surprisingly creepy breathing and getting more typically Hammerfallian with Joacim’s vocals going on about battling ordeals and resisting cravings. It continues to surprise, however, after a soaring chorus switching to the old-school with battering drums and widdly soloing. This surprise continues with the delightful Bang Your Head, opening with speed metal and continuing into the sort of hell yeah anthem that the band typically pump out four per album. The difference being that this is actually as enjoyable as the band are trying to make out, some razor-edged soloing doing what a hundred Olympic curling music videos couldn’t! Admittedly, I enjoy the band’s core listener-friendly sound for what it is – I’m sure there are plenty of power metal fans out there who will find the catchy drum beats and endless repetitions of One More Time and I Refuse very annoying. If you like a heavy dose of fun with your metal, however, Hammerfall are peerless, and whilst a few albums in their past have promised more than they delivered, Infected is as close to solid as they’re ever going to get. The cheerful stomp of The Outlaw is like something from a Bruce Dickinson solo album, 666 – The Enemy Within has good usage of keyboards, and Let’s Get It On has a galloping none-more-metal style that’s impossible not to enjoy. Even the Hammerfall-by-numbers likes of Dios De Los Mertos are enjoyable for what they are, managing to keep your attention with little touches like added double-bass and infectious riffing, nothing really new. And what’s more, there’s not a single song with ‘hammer’ in the title, which shocked me speechless for a good ten minutes when I realised (not really). In truth, it’s not all good. Cover ballad Send Me A Sign is just boring, and given the album’s fifty-minute running time seems an obvious choice for cutting. There’s also little that I’d really call brilliant here, as much as uniformly very good – nothing will stun you or make you want to relisten to their discography to see if you missed anything, as some bands can do with great new albums. Yet Hammerfall have instead created an album that is the epitome of solidity, full of fun heavy metal that does exactly the job it’s supposed to do. The silly Let’s Get It On will put a smile on your face, and the seven-minute Redemption wipes it off as you realise how good Hammerfall are when they allow themselves to be, freewheeling guitars forming a complex and interesting metal framework around a balladic base. We’re probably fated to endless albums from the band like this, full of good with frustrating hints of greatness that rarely comes to fruition. If you liked No Sacrifice, No Victory then this is worth a listen – the highlights aren’t as high, but it’s more enjoyable as a whole.